usually, we problematise this, often with the archetype of the student facebooking instead of taking part in class discussion. But I want to approach it in a somewhat different way, one that might even address the problematic version. The starting point is the assumption that if students are given something that they find engaging, then they’ll engage: i.e. any nominal objective ‘importance’ is neither here nor there. I appreciate that this is contentious, especially with its relativistic implications about knowledge and the academy, but as a heuristic it does seem to fit much of what I see in a classroom. With this in mind, we might think about how we can distract students from things that they don’t find engaging (but which we think are important), while simultaneously exposing them to those things. I’ve talked before about ‘difficult‘ subjects and this is essentially a development of that idea. Thus we might present research methods in the context of a problem-based exercise or an applied setting of a project. This requires three things to happen. Firstly, it requires us to have an understanding of what students will and won’t engage with (in broad terms): it’s no good trying to distract someone with a rubbish distraction. This implies knowing your students, especially in terms of the variability of their preferences, since these are not universal. Secondly, it means we have to know what we’re doing and why we’re doing that way. It’s all too easy to get caught up in a particular approach and forget to step back and consider what it’s for. This doesn’t have to get too metaphysical (‘what’s anything ‘about’?’), but it does need us to have an understanding of pedagogy in both general and disciplinary terms, so that we have the frameworks and language to apply to the situation. Which leads us to the final point; it requires us to point out the distraction at some point. Usually, this would be near the end of the process, so as not to undermine the effect, although I’ve had occasions when I’ve been very upfront about it all, to no obvious detriment. But closing the loop is essential, otherwise we risk students not realising what they have learnt in the process. Without that realisation, it becomes much harder to get them to apply their new knowledge and understanding elsewhere in their studies or to communicate their abilities to others (e.g. for further study). 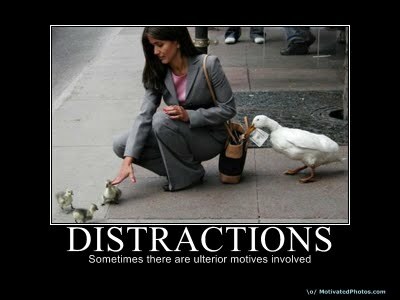 In short, distractions can useful. But not always.